Since my Knee operations, I have lost a lot of speed. Now, my revs are far in excess of my speed, and I'm really struggling. I have changed balls, eliminated all asymmetrical cores, got a Urethane ball, highly polished others, and have tried to get the ball rolling faster. I just cant generate the ball speed needed before my revs take over and crash the head pin. 2-3 splits per game is killing me. I'm not a banker into the dry, but I do have a 12 board turn in the final 10 feet. It is causing me so much trouble, that my ball driller made a recommendation. He went to a seminar and learned about a drill pattern for just my problem. So, he asked me to give him an older ball so he could try an experiment on it that may help me. And, this would be his first attempt at this drilling. I don't understand the drill change. But, he took a ball that had been drilled at 35x4x65. Plugged it. And, it now has the pin under and outside of the ring finger. The grip center line is now away from the cg to the left. It just doesn't relate to any drilling pattern I know of. But, the most disturbing thing is... This was his suggestion to try this. It was myown ball that I gave him. AND, HE CHARGED ME TO DO THIS!!! WTH, and he said with a smile, and I only will charge for materials. So, two new finger grips, a new Switch grip sleeve and bottom screw plus plug material only cost me $52 . His wall price sheet shows finger grips at $3.50 each, and the switch grip at $15, without thumb insert. So, that's $22. Did the plug material cost $30?? Thank you for the favor!! I've been in this Pro Shop since I switched houses, 7 years. And, stayed when I switched houses away. Well, I will switch proshops as well now. I left the ball there and didn't pay for his FAVOR. What you were charged does sound ridiculous based on only charging for materials. My teammate is annoyed with the current driller at the shop at my center. He's not as experienced as others we have had in the past and my teammate has needed a new ball redrilled twice because of mistakes. The first time was layout and the second time was because the span on one of his fingers was misdrilled by over 1/4 of an inch too long. Obviously, it was causing pain. I'm worried about going there myself when I decide to get a new ball. I'm tempted to start going to the shop at a different center. 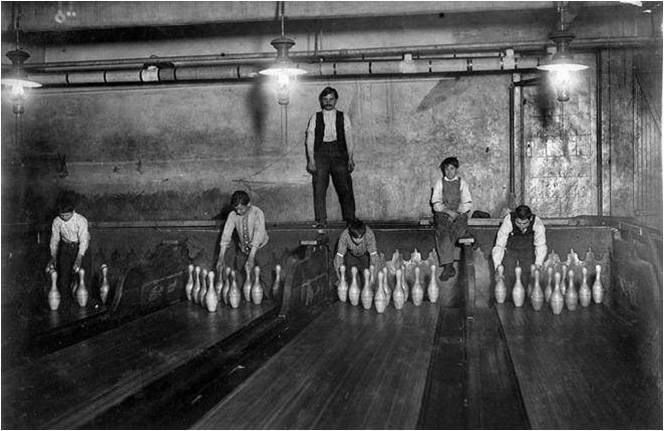 I went to the lanes on Sunday morn. The asst was running the Pro Shop. So, I took the ball to try it. that drilling was just horrible. The pin under and out made the ball react in 20-25 feet. it over turned in the dry. But, never finished in the oil. I saw the ball driller today. I told him to trash that ball. He said he thought he drilled it to roll out. WTH? Well, I left it there permanently. He did say, he was going to try it, as he wasn't really sure what it would do. I'm not his guinea pig. yeah - you should not get charged for being a guinea pig. $50 That's what my POS charges normally to completely plug and redrill. Curious to know the layout that he drilled for you? As you can see, the ball has been turned so the pin to cg line now places the cg about at the thumb hole with the pin down and out. His intent was for me to get more length with my slower speed and less of a back end reaction. Well, the opposite has occurred. The ball turns very early on a straight up line (8). And, it slides with no back reaction in oil, (15). It has absolutely no finish. While, I can't keep it on the right side straight up. the original drilling was 35x4x65. there is no name for this drill or calculation. He was playing with the core position for a forward roll. Hope this comes across ok. I'd pic the ball, showing the plugs and new hole positions, but I left it at the Shop and told him to trash it. Plugs are noticeable as he used green material on my blue ball. Looks like drilled for earlier with less hook to me. If you use dual angle theory to analyze the new drilling as shown, you have a narrow drilling angle which will make your ball want to transition early and a very wide 'Vertical Axis Line' angle which is why the pin is under and also causes your ball to straighten out. You need to discover the longest drilling angle for the surface of the ball you are drilling based on your speed. If you throw the ball slow, it's very likely your ball will transition based on speed before it will transition based on drilling angle. You might try 70-90 degrees. A longer drilling angle might also delay when your ball flares out. Since you will be well down the lane, I would use a longer pin-to-PAP distance, maybe 5 inches, to moderate flare and then reduce the VAL angle to about 45 or 50 degrees. You need a dual angle combination to 'conserve' whatever impetus you put on your ball. Any drilling combination that makes your ball roll early will kill your ball motion and encourage deflection in the pocket.